Tubs of cookie dough have been one of the best ways to raise money for years. It's a product people recognize and actually look forward to purchasing. 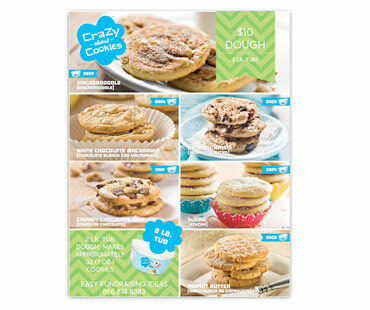 Request Cookie Dough Fundraising Brochures from us. We will immediately send your brochures and marketing materials. Once they arrive start taking orders. In a rush? Download and print out the cookie dough brochure to start right away! After you have finished selling your tubs you are ready to place your order. Ssimply place your order online or call us with your bulk order. Your cookie dough will arrive 2-3 weeks after you place your order. This has been our top selling frozen cookie dough fundraiser for four years in a row. Start selling tubs of cookie dough today. Pine Valley Foods is the leading provider of food products in the fundraising industry. That's why we chose to partner with them to develop our cookie dough tub fundraiser. Oven-fresh cookies so easy to sell. We offer a wide variety of flavors to choose from, made only from the highest level gourmet ingredients. Cookie dough can be stored at room temperature (66º-77º) for 21 days, refrigerated for 6 months, and frozen for 1 year. It can be thawed and refrozen. All products are Kosher certified and safe from any peanut butter recall. Each tub of cookie dough contains 2 lbs of cookie dough and produces 36 large .9 oz cookies. See cookie dough nutrition information (opens in new window). 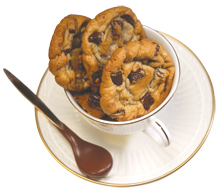 This all-American favorite has an abundance of big, rich and luscious chocolate chunks! Irresistibly sweet and creamy best describes our classic peanut butter cookies. Cinnamon, rolled oats and raisins create deliciously moist old fashioned favorites! Our buttery dough mixed with cinnamon and sugar will take you back to Grandma's kitchen. These cookies will melt in your mouth and leave you wanting more! Premium white chocolate chips and Hawaii's pearls of paradise are blended with our fabulous dough to create the perfect tropical escape. Call us toll free at 1-888-778-2580 or email us at . We'll send you a free guide filled with fundraising ideas to get you started. Copyright © 2002-2019 FastTrack Fundraising Corp., all rights reserved.